The spirit of Halloween is starting to fill the air already! 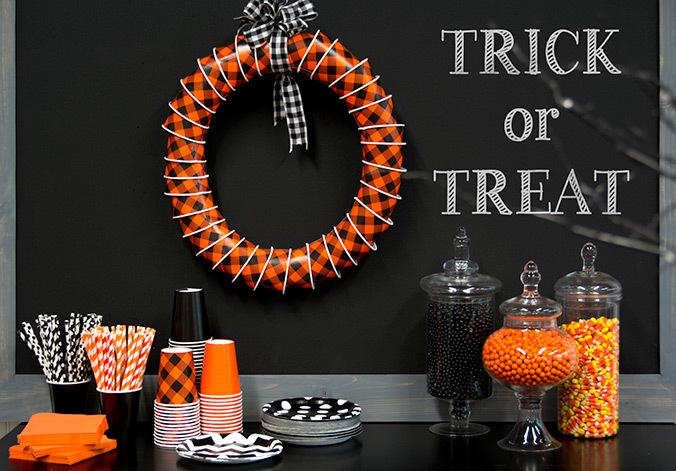 To help you get ideas on how to celebrate, we’ve come up with a classic orange and black Halloween party design that everyone can enjoy. Keep reading to get inspired! Trick or treat! BuyCostumes isn’t just about Halloween costumes, you know – we have tons of Halloween party supplies, too, and here’s a brand new theme we’ve designed for Halloween 2014! 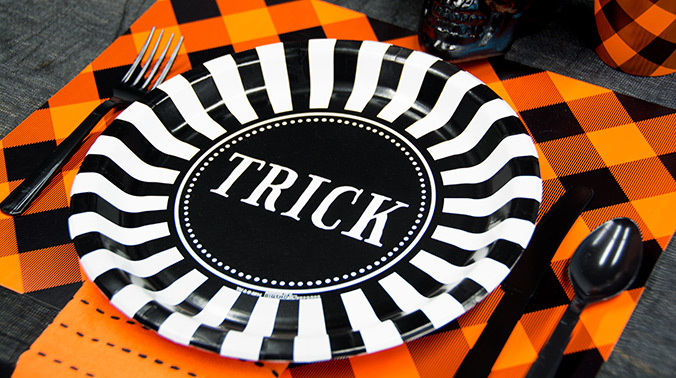 Plates feature the words “Trick” and “Treat” in big, bold type that can easily be accessorized and built upon with other black and orange party supplies. Paper cups don’t need to be boring. 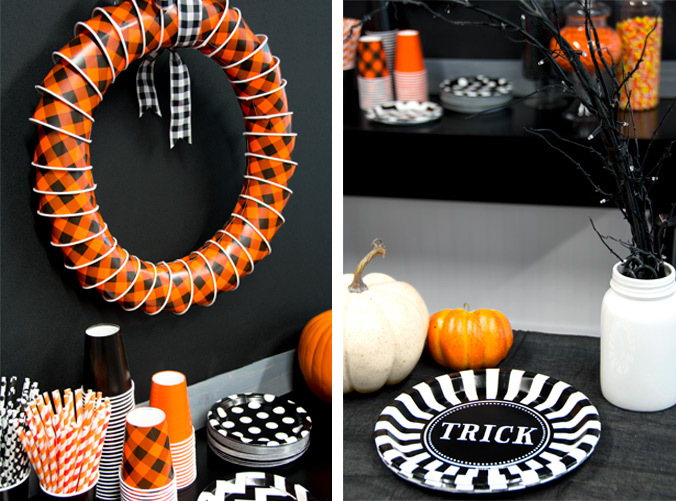 These feature an awesome orange and black plaid pattern that’s suitable for any Halloween celebration. We’ve even taken it one step further by using them create an easy wreath. To make your own, just nest cups partially inside each other, and fix in place with hot glue. A bow of black and white gingham fabric completes it! 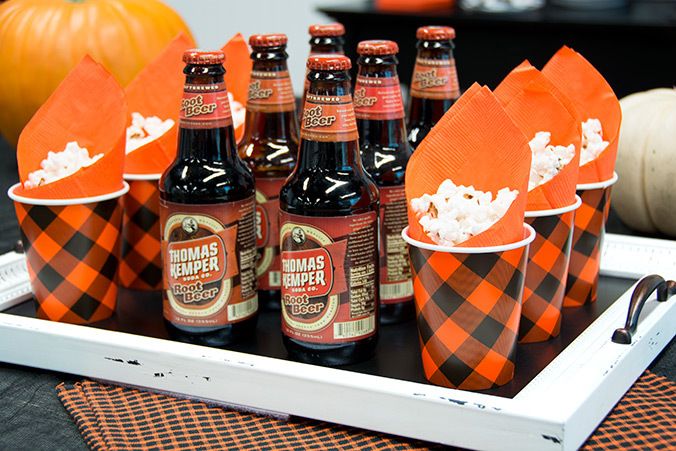 Another fun way to use paper cups is to set up personal popcorn servings. Fold a colorful paper napkin of it inside like a cone – this adds to the look and provides ample space to fill. Then, just add a handful of your favorite snacks! 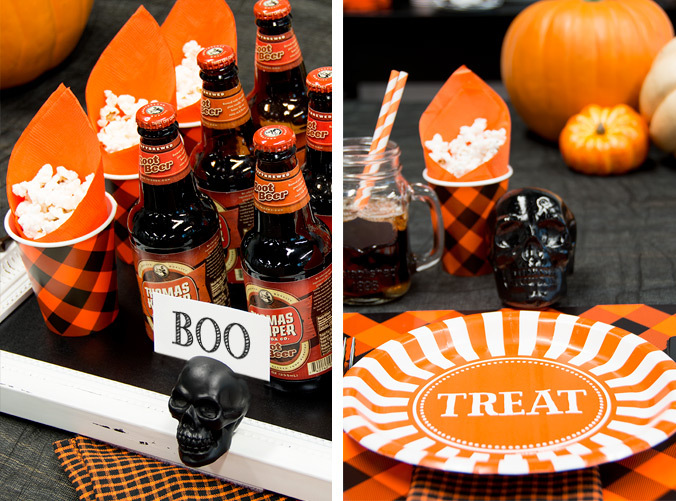 Skull shaped decorations and pumpkins are two easy ways to build up your tablescape and add some variety to your party. 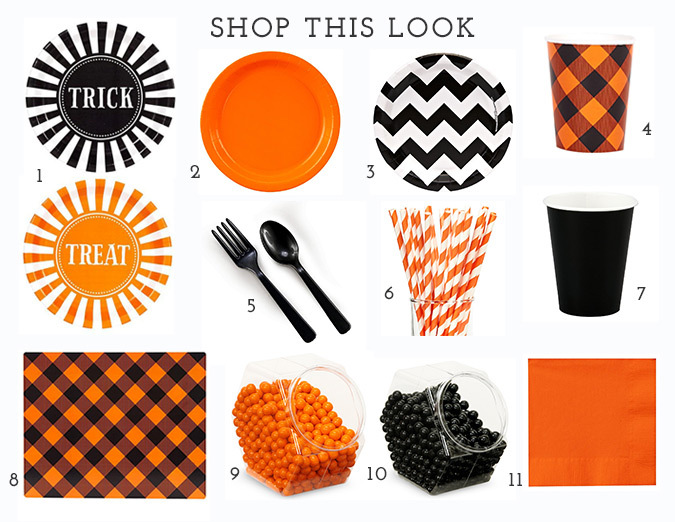 Click inside the graphic below to Shop This Look and get everything you need for your Halloween party theme! But wait, there’s more! 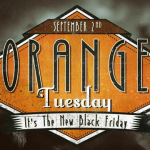 That’s right, it’s a bonus blog: We can’t get enough of orange and black, so we also took the idea in a gloomier direction. 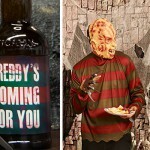 Take these extra Halloween party ideas as a sign of things to come – more and more Halloween themes are coming to BuyCostumes soon enough! As mentioned before, pumpkins make perfect Halloween decorations. But, you don’t have to leave them as their orange and boring old selves. Wrap them in ribbons and tulle to create a more unique look that will help your party stand out. 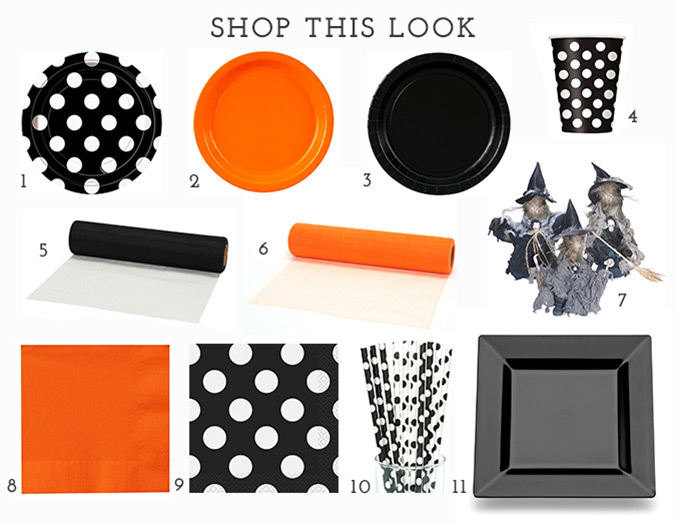 Aside from plain orange and black party supplies, we worked in some polka dots this time – build a layered look with varying patterns and solid colors. 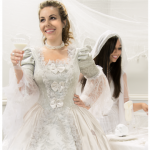 You can creatively display paper napkins at each place on the table by folding them like an accordion, and fitting them into a plastic champagne flute, as shown. 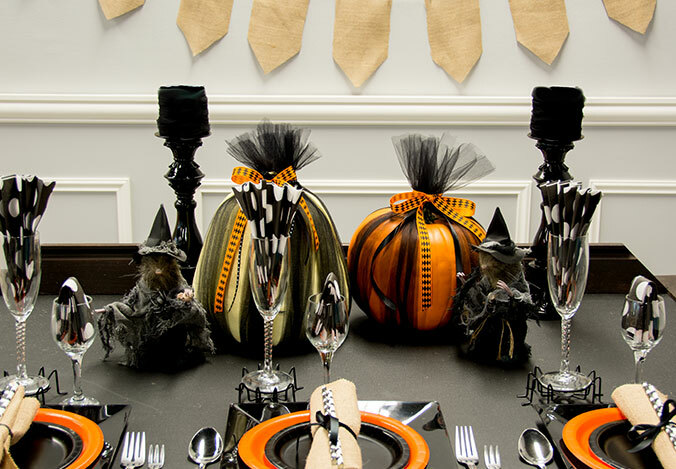 We used these witch mice decorations as fun Halloween centerpieces. 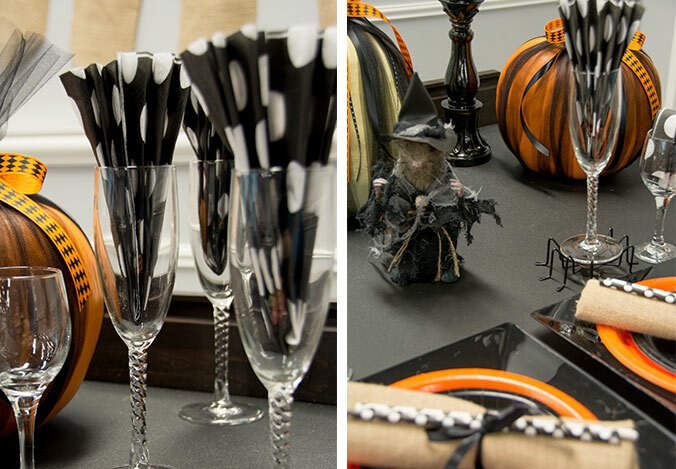 Shop our selection of Halloween props to get inspiration for your own party! 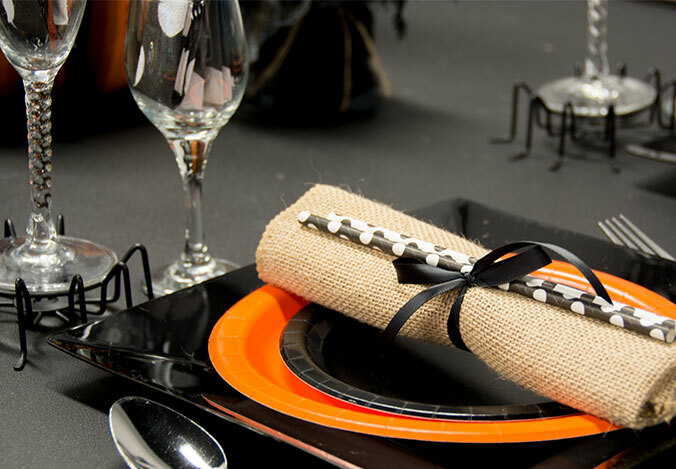 Here’s an idea table setting idea that with the Halloween atmosphere perfectly. Tableware can be wrapped in a simple piece of burlap fabric, and held close with a bow of thin ribbon. Add straws for a finishing touch! 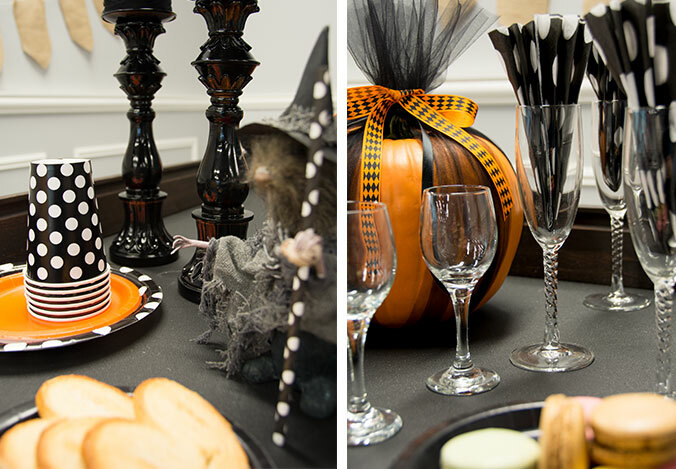 Will you be throwing a Halloween party this year? 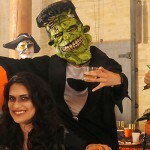 What was the best Halloween party theme you’ve ever seen? What kind of Halloween party should we come up with next? 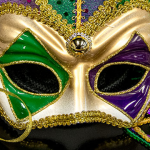 Share your thoughts with us on Facebook and on Twitter @BuyCostumes! Be sure to check out our Pinterest boards too, where we’re always adding new Halloween costume ideas and inspiration for Halloween parties. Join us at the #OrangeTuesday Kickoff Twitter Party!